. people living on steep slopes or rocky soils. They must be cheap, light and easy to handle. We use mostly recycled styrofoam boxes of all sizes and shapes. They keep the soil cool in summer when black plastic containers can get hot. They must be food-grade standard as industrial boxes may contain undesirable chemicals to stop moulds. Painting them looks better and protects against the sun. A painted box has lasted eight years and only recently showed signs of decay. They must have drain holes. We want free water inside the box up to the level of the drain holes. It should not be higher to avoid the box becoming a swamp. Not having drain holes causes disaster in wet weather. The water is held in the reservoir and in the soil next to it. The water wicks up into the soil when plants use the water held in the soil. 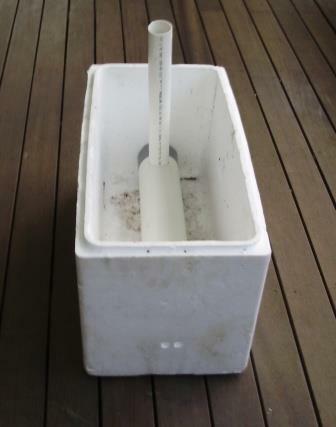 Any structure or box that is 30 - 45 cm high and holds water will do. length of the box, to act as reservoir. OUR EXPERIENCES WITH WICKING BOXES. We have grown a very wide range of annual crops in wicking boxes: lettuce, carrots, beet roots, beans, shallots, many spinach crops, radish, strawberries, various mints, watercress, and many herbs. Bushy perennial crops are not suited for wicking boxes. They grow too big and their roots can penetrate the styrofoam. Growth rates are high as a plant will have a moist layer of fertile soil at the surface for feeding and ample deep water for transpiration. Once the seedlings are established, we water only through the fill pipe.The water can last for a week in summer (less during extreme heatwaves) and several weeks or a month in winter and/or while plants are small. It is useful to let the plants use up the free water. That stops it from becoming anaerobic and it kills mosquito larvae. It does not set the crop back. Crop feedig is through the fill pipes. 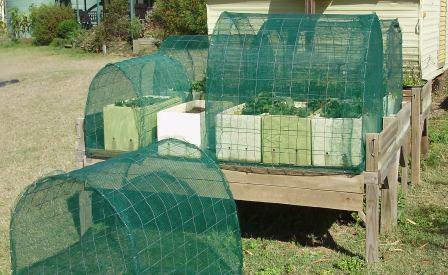 Wicking boxes are very good for organic growing, as long as care is taken not to go wild with liquid organic supplements. A little bit often is far better than a heavy dose at once. These concentrates can kill if not strongly diluted. We have done that. Using artificial fertiliser can be very tricky as it is even easier to 'overdose' with them than with organic supplements. As there is very little water lost or flushed out of the box, the unused parts of the fertiliser can quickly accumulate to toxic levels. 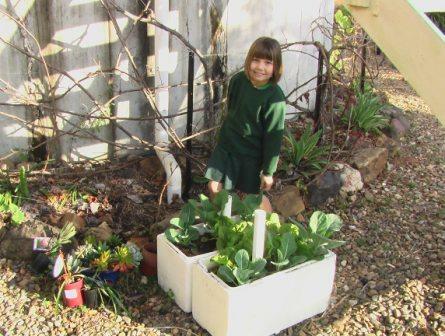 Amy wanted to grow vegetables for her scout badge 'just like Peter does in his shade-house but not as big as that'. We had two boxes and a bit of pipe lying around and improvised. It worked well, Amy got her badge and we got the idea of wicking boxes. That was in 2005. The boxes are still being used. We have been through several simplifications and now mainly use this design. It works best, lasts for years and costs next to nothing. Best of all it keeps cool even during heatwaves. We use any size of styrofoam box. All it needs is: a box, two pieces of pipe, some duct tape and a bit of spare time. We now use about 80 of them. Another early design for someone near Perth working away-from-home shifts. 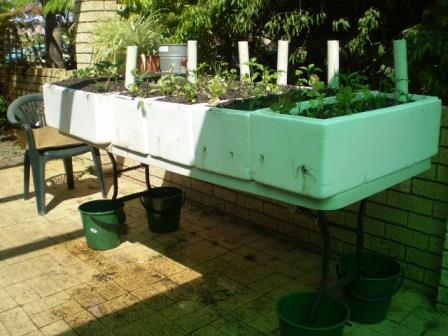 To stop snails eating the crops, the table legs are standing in buckets with water. When the owner moved East, the table and boxes went to a friend. We made covers from wire mesh (100x100mm), 30% shade cloth and bits of timber for spacers. If it was not for the covers, the birds would have eaten all our strawberries. Wicking boxes are the simplest way of using the wicking principle. Our main advice is: keep them simple and avoid embalishments.